Le spectacle Out of Shadowland qui est présenté à Hangar Stage situé à Lost River Delta à Tokyo DisneySea s'arrêtera définitivement le 31 mars 2019. Il sera remplacé à l'été 2019 par Song of Mirage, un nouveau spectacle d'une demi-heure autour de Mickey Mouse, Minnie Mouse, Donald Duck et Dingo, mêlant danses, chansons et projections vidéos. Crédit illustration : Tokyo Disney Resort. 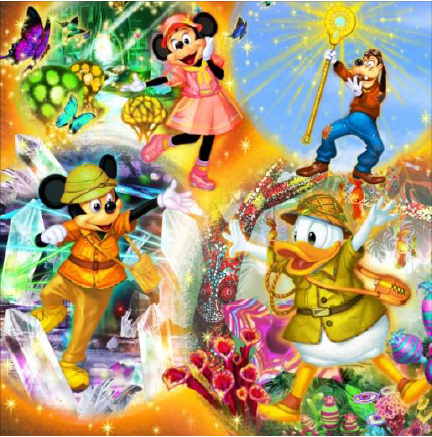 Oriental Land Co., Ltd. announced that a new stage show, “Song of Mirage,” will open in the summer of 2019 at the Hangar Stage, located in Lost River Delta at Tokyo DisneySea Park. Created expressly for the Hangar Stage, this show features an original story, singing, dancing and everyone’s favorite Disney Characters in a rousing live performance with impressive projection mapping. staff points the way, they discover exciting worlds – a paradise of plants, a cavern of gorgeous crystals and ancient verdant ruins – where they have some wonderful encounters as lively rhythms surround them. Then as the power of their wishes reaches a climax, a bright fanfare is heard and before their eyes the vast, majestic land of Rio Dorado appears. Swept up by all they see, they join in an enthusiastic celebration. Tokyo Disney Resort - 17 juillet 2018. J'ai beaucoup aimé Out of Shadowland, un spectacle très poétique, très content de l'avoir vu au moins une fois. Le spectacle Song of Mirage, d'une durée de 30 minutes, sera présenté pour la première fois le mardi 23 juillet 2019 ! Comme annoncé en juillet dernier, l'actuel spectacle Out of Shadowland sera présenté pour la dernière fois le 31 mars 2019. Oriental Land Co., Ltd. announced that a new stage show, “Song of Mirage,” will open on July 23, 2019 at the Hangar Stage, located in Lost River Delta at Tokyo DisneySea Park. Created expressly for the Hangar Stage, this show features an original story, singing, dancing and everyone’s favorite Disney Characters in a rousing live performance with impressive projection mapping. Mouse and Donald Duck – make their way into the hangar. Donald has picked up a mysterious staff which magically leads them on an exciting adventure.